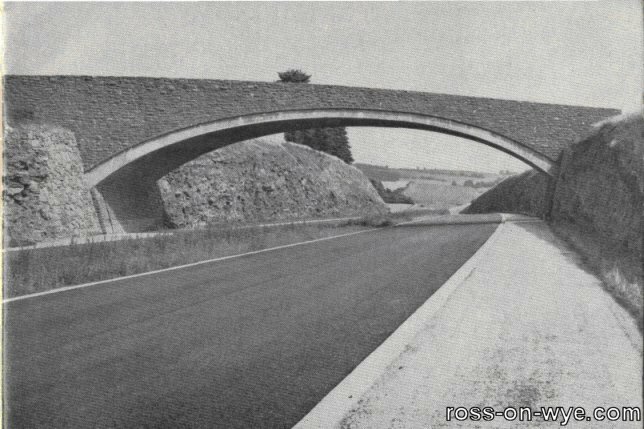 The Preston By-Pass was started in 1956 and opened in December 1958, thus becoming the first completed length of motorway in the country. This formed part of the proposed Birmingham-Preston Motorway. The London-Birmingham Motorway, the M1, formed the first section of the London-Yorkshire Motorway. This was started in March 1958 and opened to traffic in November 1959. In 1960, a scheme for the second part of the motorway, that between Crick and the Doncaster By-pass, had been made and a draft scheme for a spur from this motorway to Sheffield and Leeds was being prepared. In the spring of 1960, traffic on the M1 was averaging nearly 16,000 vehicles a day. A study showed that the average time saved on a journey from London to Birmingham along the M1, compared with the same journey along the A5 and A45 prior to the motorway opening was 42 minutes for a car, 31 minutes for a light goods vehicle, 27 minutes for a medium goods vehicle and 21 minutes for a heavy goods vehicle2. By 1960 the Preston By-pass, Ross Spur (M50), Lancaster By-pass, London to Birmingham (M1) Motorway and Maidstone By-pass were complete with the Doncaster By-pass, Stevenage By-pass, Birmingham to Bristol (M5 - Birmingham to M50 section) Motorway, Stafford By-pass, Maidenhead By-pass and several Viaducts on the Birmingham-Preston-Penrith (M6) were all under construction with many other routes being planned. England and Wales are divided into six sectors by the six great routes radiating clockwise from London (A.1 to Edinburgh, A.2 to Dover, A.3 to Portsmouth, A.4 to Avonmouth, A.5 to Holyhead and A.6 to Carlisle), sector one lying between A.1 and A.2, sector two between A.2 and A.3 and so on. All other Class A roads in England and Wales have two, three, or four-figure numbers, the first figure of which is the same as the number of the sector in which it starts. In the same way Class B roads in England and Wales have three, or four-figure numbers, the first figure being the same as the appropriate sector number. The building of the M50 motorway started in March 1958 and it opened to traffic in November 1960. 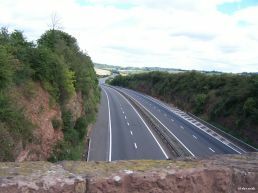 The M50 crosses Worcestershire, Gloucestershire, and Herefordshire and was seen as a vital part of the link from Birmingham to South Wales which meant its building was given priority over many other motorways. 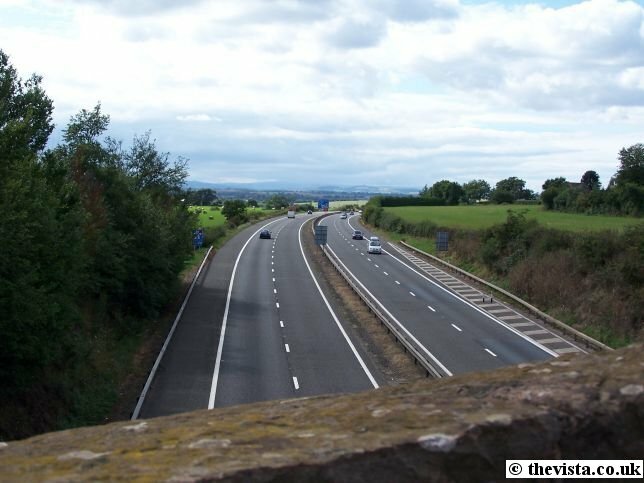 Additional to the motorway, a 1½ mile bypass was added around Ross. 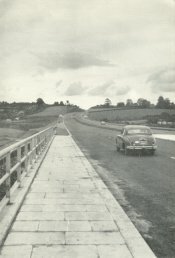 The M50 was almost complete before the M5 came to join up with it. For several years the M5 terminated at the M50 at Bredon Field Farm just south of Strensham. Its 21 miles were designed to be covered in 20 minutes at 70 miles per hour and, in 1961, it was expected to be able to carry 10,800 passenger car units a day with this increasing in the future to a maximum of 35,000 car units per day. As part of the design a maximum curvature on corners was 2,046 ft radius, with a maximum gradient of 1 in 25 and a minimum of 800ft visibility. The road was designed as dual 24 foot carriageways with four marginal strips 12 inches wide. The central reservation was designed to be 13 feet wide with hard shoulders 8 foot wide in 11 foot 6 inch verges. This cost approximately £6,000,000 to build. Reputedly each of the junctions on the M50 was of a different style as it was used to develop and evaluate each design to allow improvements in future motorways. 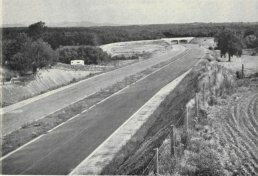 The motorway is virtually unchanged unchanged since it was built. This is the best chance to see a motorway as it appeared in the early sixties, with no hard shoulders through bridges and tight junctions. The main additions since 1961 have been the crash barriers down the central reservation and the changeable matrix signs. On March 3rd 1958 an Inauguration Ceremony took place in Herefordshire and the Rt. Hon. 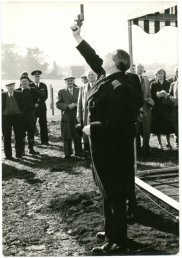 Harold Watkinson P.C., M.P., Minister of transport & Civil Aviation, lifted a pistol into the air and fired a starting flare. 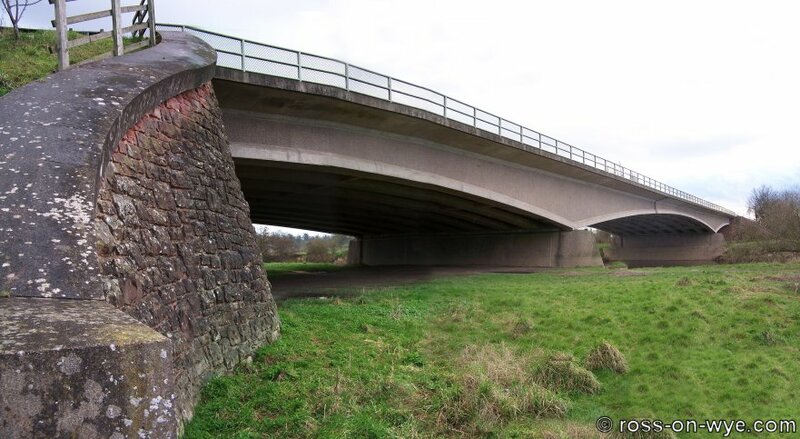 The M50 has a number of bridges and viaducts over intersecting roads and flood plains but there are two major bridges, one over the Severn at Queenhill and the other over the Wye at Bridstow. 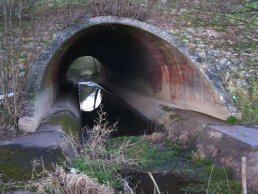 Local stone was used for facing parts of several overbridges; such as the Rudhall Bridge in Herefordshire and the Jay's Green interchange. The Queenhill Bridge, together with its approach viaducts, is half a mile long and cost over £1¼ million to build. It is a three-span continuous steel girder bridge with a centre span of 140 foot (and headroom of 44 foot) and two side spans of 130 foot each. The bridge is of dual construction, which means it is built in two separate parallel halves with each half carrying one of the dual carriageways. There are twin anchor piers of reinforced concrete which splayed as they rise to deck level. The viaducts consist of 24 spans of 82 foot each. These also have to be of dual construction, each half being supported on a single line of columns all made of reinforced concrete. Initially only one carriageway was open to traffic and the other opened in the spring of 1961 when the bridge was completed. At the Ross end, on the By-pass, the road is carried over the River Wye by the Bridstow Bridge. With its associated embankment it is 2,000 feet long out over the river's flood plain. The actual Bridstow Bridge is a three-span pre-stressed concrete structure 353 feet long with a clear span of 203 feet in the centre and two approach spans of 75 feet. 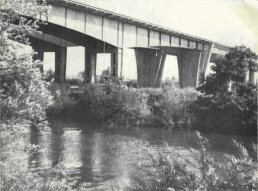 The bridge is supported by two reinforced concrete piers, one on either side of the river and by reinforced concrete abutments. The actual embankment has a highest point of 33 feet and is pierced by seven flood relief arches. There are several styles of flood arch. Some, like the one to the right, have a gully up the centre to channel run-off water whilst others have a smooth floor. The below-left shot is a 1960s view is taken off the Bridstow Bridge and there is very little traffic to be seen. Also note that there are no crash barriers up the centre of the dual carriageway and that the pull-in place just after the bridge would hold only one or two cars. To the left the railway can just be made out and to the right can be seen Springfield House on top of the hill, which was the manor house to the north-west of Ross. The below-right shot is a 2008 view taken from the pull-in place just after the Bridstow Bridge. 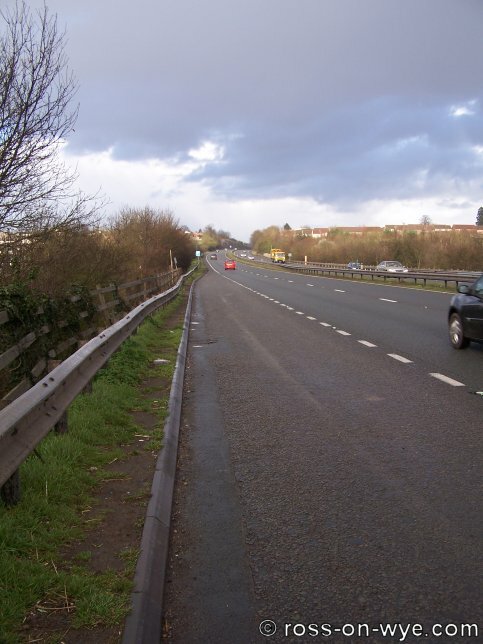 There is much more traffic with a crash barrier up the centre of the dual carriageway and that the pull-in place is considerably larger than in the 1960s. To the left the line of where the railway was is now obscured by the bushes on the verge and to the right Springfield House has been replaced by the sprawling Wye Croft Park housing estate. This shot shows the road between Ross and Hereford prior to the A40 bypass being built. The junction is at Wilton, with Bridstow School in the background, and going off to the left is the old road to Monmouth. 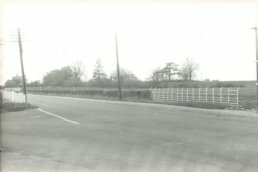 In the present day, this is where the roundabout is now. The construction of the motorway presented many excavation and filling problems for the labour force of over 1,200 men. Just under 1¼ million cubic yards (approx. 750 thousand cubic meters) of material had to be blasted and dug away to form the cuttings, which are over 35 feet (approx. 10.5 meters) deep in several places, and transported to build embankments on the lower sections. Additionally thousands of tons of stone had to be imported for the base courses of the carriageways. 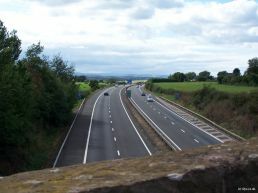 Because the motorway crossed three counties, the roads and bridges, apart from some of the major bridges and the bridges in Gloucestershire, were designed by the County Councils as Agent Authorities of the Minister of Transport. These were the Worcestershire County Council (Surveyor Mr. W. R. Thomson), the Gloucestershire County Council (Surveyor Mr. R. A. Downs) and the Herefordshire County Council (Surveyor Mr. D. H. Banks). Contract No. 4: This was mainly in Worcestershire and included the extensive bridgeworks and viaducts over the River Severn, was carried out by Messrs. A. E. Farr Ltd.
Contracts No. 3 and No. 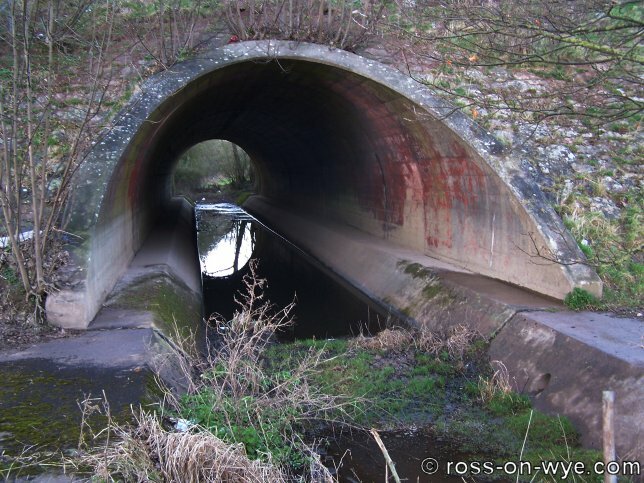 2: These covered the lengths to the Herefordshire boundary including the Bury Court flyover junction. This was carried out by Messrs. R. M. Douglas Ltd., of Birmingham. Contract No. 1: This covered the remainder of the project and including the Ross By-pass and Bridstow Bridge, was carried out by Messrs. Tarmac Civil Engineering Ltd.
Sir Alexander Gibb and Partners were the Consulting Engineers for the Queenhill Bridge and Sir William Holford and Partners were the Consulting Architects. As for Bridstow Bridge, Messrs. Scott and Wilson, Kirkpatrick & Partners were Consulting Engineers and Messrs. Ansell and Bailey were Consulting Architects. The 11 bridges included in Contract No. 2 were designed by Messrs. W. S. Atkins & Partners, Consulting Engineers. The M50 has been a test bed for several items and schemes, details of a few of these follow. In the spring 2003, RMC Aggregates used around 35,000 tonnes of asphalt containing crushed glass, known as Glasphalt which contains 30 percent crushed glass, was used to resurface both carriageways of the M50 motorway3. This glass would otherwise likely have ended up at landfill as it is predominantly green glass which, when crushed, has very few end markets. The Glasphalt was laid on a 5.4km stretch of the M50 motorway linking Gloucestershire with Herefordshire by RMC Surfacing. The macadam was specified as a base and binder course, which are the foundation layers of a road, and its use on the M50 represented the first time crushed glass had been used to resurface a British motorway. Glasphalt had not been fully approved for motorway use under the Highway Authorities’ Product Approval Scheme (HAPAS) so before it could be used on a motorway, it had to be granted a special dispensation by the Highways Agency. The renewing process began on the eastbound carriageway of the M50, with three planers working to scarify the existing road surface to the required depth. In order to do this a contraflow was set up for traffic on the westbound carriageway This remained in place until the works switched to the westbound carriageway and the traffic moved to the eastbound side. The removed road material was taken away before fresh quantities of Glasphalt were brought to site in insulated trucks at a rate that ensured the contract was supplied with a consistent quantity of material. The material was layed by a conventional tracked paving machine to seven different thicknesses of base and binder course material, specified depending on the condition of the particular section of carriageway being overlaid or reconstructed. The resurfacing works were between junctions one to two, Bushley Brook to Longdon Brook, and cost £7.2M. The works ran from February to July 2003 and were managed by contractors AmeyMouchel. The civil engineering contractor was John Martin Construction with specialist surfacing contractor being RMC Surfacing. During the works the traffic management contractor was H.W. Martin. In early 2004, RMC surfacing conducted some of the widest ever single single-pass motorway surfacing on the M50 near to Ross1. The surface, also known as paving, was more than 8.5m wide. It was applied in a single pass across the entire carriageway over a two-kilometre stretch of the motorway. The M50 motorway comprises of two lanes bordered by a sub-standard hard shoulder on each carriageway. To minimise disruption to the travelling public, resurfacing was carried out during a single shift over one weekend. The aim was to demonstrate the advantages being able to surface dual carriageways in a single hit. The surface was applied using a tracked Vogele Super 1804 paving machine with a high-performance screed built to accommodate the extraordinary width. In order to carry out this surfacing, the paving contract required 1,000 tonnes of RMC's HAPAS-accredited proprietary Viatex thin surfacing system.